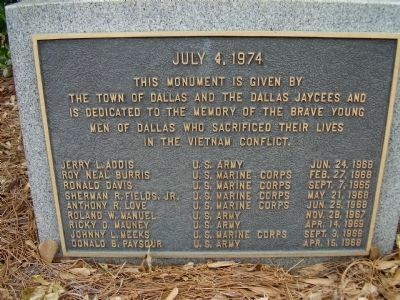 This Monument is given by the town of Dallas and the Dallas Jaycees and is Dedicated to the memory of the brave young men of Dallas who Sacrificed their lives in the Vietnam Conflict. Erected 1974 by Town of Dallas and the Dallas Jaycees. Location. 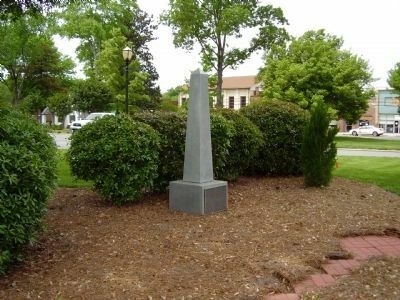 35° 18.954′ N, 81° 10.578′ W. Marker is in Dallas, North Carolina, in Gaston County. Marker is on N Gaston Street (County Route 2278). Touch for map. Marker is in this post office area: Dallas NC 28034, United States of America. Touch for directions. 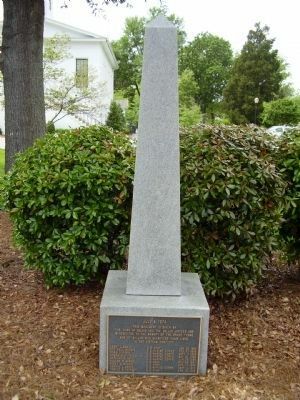 from this marker); Gaston County Courthouse (former) (within shouting distance of this marker); Confederate Soldiers Monument (within shouting distance of this marker); Hoffman Hotel 1852 (within shouting distance of this marker); Rhyne Store (within shouting distance of this marker); Dallas (within shouting distance of this marker); Smyre - Pasour House (about 300 feet away, measured in a direct line). Touch for a list and map of all markers in Dallas. More. Search the internet for Vietnam Memorial. Credits. This page was last revised on June 16, 2016. This page originally submitted on May 3, 2009, by Stanley and Terrie Howard of Greer, South Carolina. This page has been viewed 812 times since then and 6 times this year. Photos: 1, 2, 3. submitted on May 3, 2009, by Stanley and Terrie Howard of Greer, South Carolina. • Kevin W. was the editor who published this page.